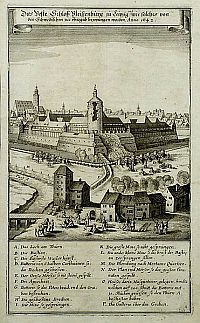 Das Veste Schloß Pleißenburg zu Leipzig, und wie solches von den Schwedischen zur übergab bezwungen worden, Anno 1642. Exponent of a Saxony family which furnished professors and administrators to the University of Leipzig, where he was a doctor of theology and professor of Greek and Latin. Catalogus Bibliothaecae selectae Georgi Philippi Olearii, Lipsiae, Langenheim 1741, 470 p.
The catalogue published at the death of Olearius is divided into six sections, each further subdivided according to the format (In Folio, In Quarto, In Octavo, In Duodecimo et Sedecimo) and sometimes according to the following indications: Libri Incompacti, Libri Compacti, Libri Miscellanei, Manuscripti. The catalogue contains 8,453 titles: 6,858 from the first three sections, 955 Libri Medici and 640 from the last two sections. There is no introduction or index of names.